At the Xiangjiang Safari Park in Guangdong Province live three Bengal tiger cubs. It was the first-time for their mother to give birth to offspring. Due to inexperience, the tigress abandoned them soon after they were born. Desperately the park officials tried many ways to get them to eat, including bottle feeding. But the cubs were slow to adapt, and lost their weight after a few days due to starvation. Finally, the park officials got an inspiration: "This is the Year of the Pig. 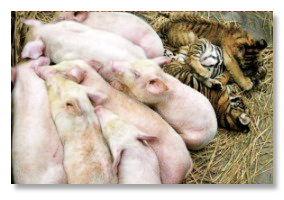 Why don't we get a female pig and see if she could raise the cubs?" So, they bought a pig mother who had just given birth. 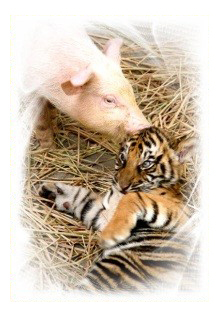 As soon as the pig mother arrived, the tiger cubs crawled to her for breast feeding. 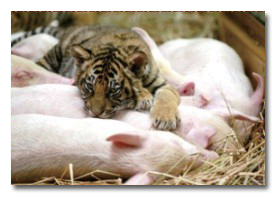 The pig mother did not refuse, and happily accepted the three little tigers as her own. Now the three tiger cubs look strong and act energetic, and are getting along very well with their piglet brothers.